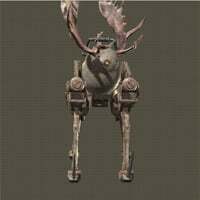 Animal Machine is a Peculiar Machine enemy in NieR: Automata. "This Unit--a medium sized quadruped with antlers on its head--resembles an animal in both appearance and behavior. After forming a pack of ferocious beasts and attacking the native animals, it appears to have been ostracized by its fellow machine lifeforms." what the *****? where do i find this?